Posted on July 16, 2013 | Comments Off on Is it or isn’t it? We moved the deer cam up into the woods. In addition to deer, squirrels, etc., we caught this photo. I think it’s a female bobcat which typically weigh between 15 and 22 pounds. Unfortunately, the photo was taken at dawn, around 7:45 on Sunday so it’s in a grey light, not either day or night. It’s about twice as big as a house cat (which don’t last too long in these woods with so many coyotes around). If you zoom in on the photo, you’ll see that the legs have bands and that the back legs are longer than the front giving the bobcat its characteristic cheetah-like walk. Anyway, stay tuned. There may be more pix to come. 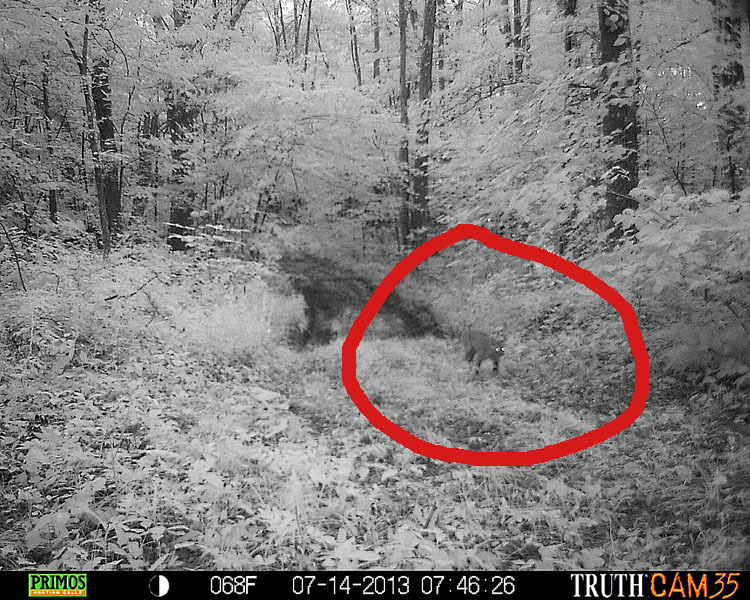 This entry was posted in animals, country living and tagged bobcat, country living, deer cam. Bookmark the permalink.